Treated wastewater has become a valuable resource that supports several of our state’s riparian areas. To view the large scale operation involving Phoenix’ treated wastewater we’ve arranged a tour of the Tres Rios wetland ponds at the Phoenix Waste Water Treatment Plant. This will be held on Friday, May 22, 2015 at 8:00 a.m.
Staff from the Tres Rios Wetland will provide a tour of the flow regulating and overbank wetlands on the northwest edge of the Salt River at 91st Avenue. Group size is limited to the first 25 persons who register. The tour ends at 10:30 a.m.
We’ll meet at 8:00am at the 91st Avenue Wastewater Treatment Plant located at 5615 South 91st Avenue, Tolleson, 85353. Enter thru the main northgate where we’ll sign in at the Admin Building and start the shuttle over to the ponds. Expect some walking on dirt paths. Bring sun protection, water, camera, and binoculars. The deadline for attendees to sign up in advance is c.o.b. May 20, 2015. 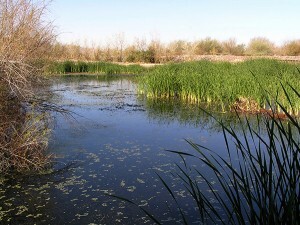 To register for the tour, and for more details please go to https://www.eventbrite.com/e/tres-rios-wetlands-tour-tickets-16763694662 Questions, please contact Tim Flood, Conservation Committee at tjflood@att.net or 602-618-1853. More information about Tres Rios may be found at their website. ← Welcome Aboard New Officers!